In many parts of Mayo the night sky is still experienced as pristine and unfiltered due to low levels of man-made lighting. The Mayo Dark Sky Festival 2018 will take place from November 2nd to 4th 2018. 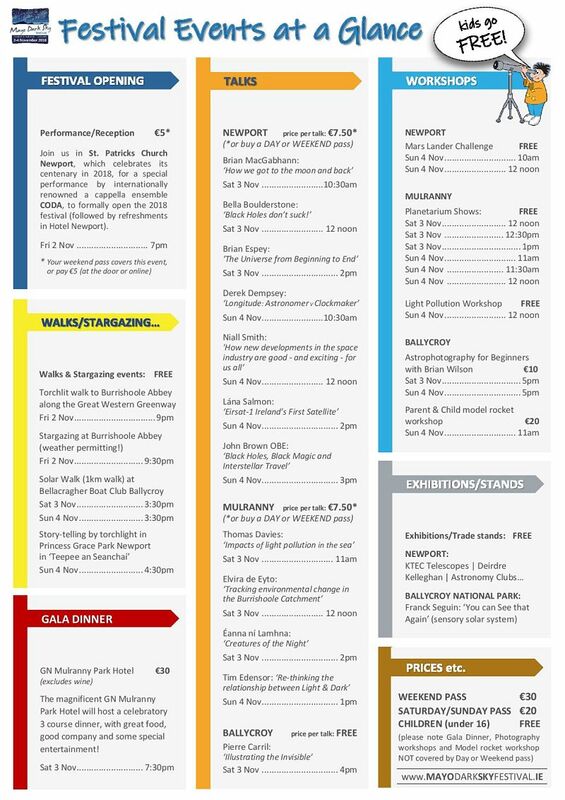 The towns of Newport, Mulranny and Ballycroy look forward to welcoming you back to Mayo for another great weekend of astronomy, science, culture, ecology and FUN! Thanks to the National Parks and Wildlife Service (NPWS), a FREE SHUTTLE SERVICE will run between the festival venues over the weekend of the festival. 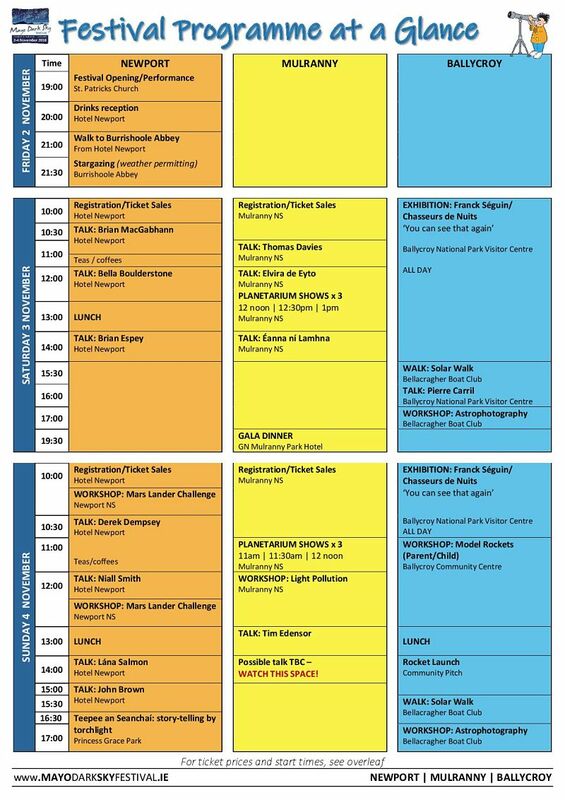 The bus timetable is available on the Festival website here. The festival’s eclectic programme celebrates the natural nightscapes of Mayo with stargazing and observing sessions, cultural workshops, educational talks and activities for all the family to enjoy. Many events are free of charge. – GALA DINNER ticket sales will finish at midnight on Wednesday 31st October (final booking date). – ALL OTHER online ticket sales will finish at midnight on Thursday 1st November. You may attend talks without pre-booking – simply pay at the door (€7.50 per talk). There are many FREE events that do not require booking. For the opening night performance by renowned group Coda, entry is €5 at the door (or Free for those with a Weekend ticket). The Mayo Dark Sky Festival 2018 features a line-up of speakers from Ireland and abroad, who are highly regarded in their fields of expertise. Their words will help bring to life the magic of our natural dark skies and give an insight into how they are important from the point of view of science, culture and the environment. – Environmentalist and broadcaster, Duncan Stewart has been added to the line-up of talks and will make an impassioned plea about the importance of our natural dark sky assets (Mulranny National School, Saturday afternoon 2pm). – Tom Davies of Exeter University, who is especially interested in how human activities alter the structure and functioning of ecosystems. Tickets are selling fast, so avoid disappointment by purchasing a weekend pass, Saturday pass, Sunday pass, gala dinner, rocket workshop or photography workshop ticket via our website now! €20 for a one day pass and €30 for a weekend pass offers great value for money! For more information email mayodarksky@gmail.com. CHILDREN UNDER 16 will be admitted FREE to all events. 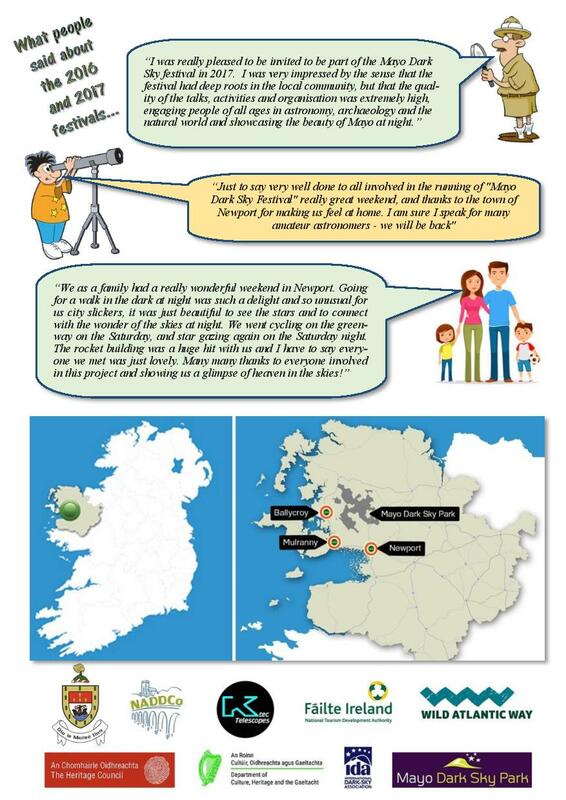 Ireland’s first International Dark Sky Park is in Co. Mayo. It showcases some of the darkest, most pristine skies in the world. The Mayo Dark Sky Park is nestled between the Nephin Mountain Range and the Atlantic coastline and it extends across an area of 150km2. It encompasses both Ballycroy National Park and Wild Nephin Park. On a clear night in Mayo, we can see over 4,500 stars, along with other planets in our solar system, The Milky Way and even meteor showers with the naked eye. The Mayo Dark Sky Park has committed to keeping the skies above its location naturally dark for present and future generations to enjoy these wonders of the night sky.